Last weekend I went to see a play called “Familiar.” I went to see it because I’d heard it was really funny; all of my theater friends on Facebook who’d seen it said it was hilarious and good, and told everyone they should go see it, too. I also went because this guy I was in a Shakespeare class is in the cast, and he seems to have made it in the acting world; he was in a production that went from Seattle to LA to Broadway, and “Familiar” is a joint production between Seattle Rep and the Guthrie. I enjoyed being among an audience of people who were like the family I married into, and I was really glad that it was a play I could take Kyle to and he’d enjoy it, too. 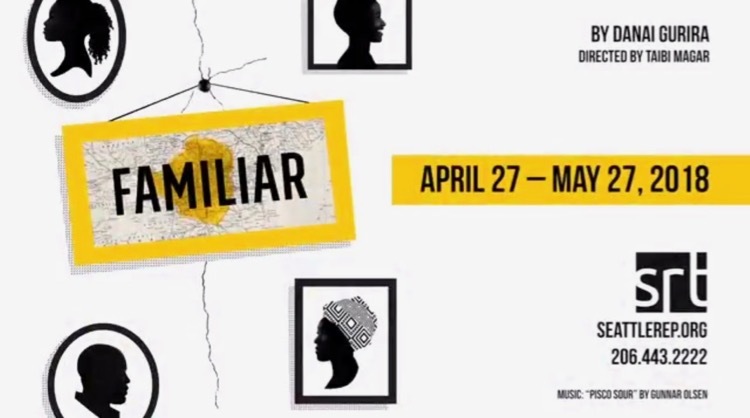 “Familiar” is about a family that moved from Zimbabwe to the United States in the early 1980s – to Minneapolis, in particular, hence the Guthrie being a coproducer. The older people in the family speak a mixture of Zimbabwean-accented English and Shona, and love the life they’ve created for themselves in the United States; their young adult children love the United States but wish they had more connection with the country their parents grew up in. The guy I know in the cast plays the young, white, many-generations-American man that the older daughter of the Zimbabwean parents is engaged to be married to. Actually, one thing I really liked about the play was the cross-cultural experiences. The awkward scene where the young white man is alone with his Zimbabwean American soon-to-be father-in-law reminded me of awkward conversations between me and my African-American father-in-law back when my husband and I hadn’t been married very long. Like my friends on Facebook had said, the play was really funny. The script is well written, and the director had gotten the maximum amount of comedy out of it. But I think most of the audience enjoyed it more than I did; being a former playwright, I was too aware of the mechanics of the humor, and there were a couple of really important moments when I thought the director had emphasized the humor at the expense of genuine, heartfelt pain and anger the characters were experiencing. But what do I know? It’s not my culture. Still, the dialogue was excellent and the actors were really skilled, and the comedic timing was impeccable. At some point, I realized that what a lot of the audience might’ve been experiencing was different from what I’d been expecting. When I saw “Joe Turner” with an audience full of African-Americans, I was experiencing their joy at seeing their ancestral American culture. They were seeing some of the lives their grandparents might’ve lived. They were reliving some of the stories their parents and grandparents might’ve told. My husband’s family aren’t theater-going people, but they’d enjoy “Joe Turner”. I think what the audience at “Familiar” was enjoying was seeing where their African-American experience might have come from, from African ways of talking and relating and moving and speaking. The African-Americans in the audience were seeing where some of their culture might’ve come from, the culture that was brought to this country by force and somehow lasted through years of slavery, deprivation, and discouragement. After the play, most of the audience who waited in the lobby for the actors to come out, were Africans and African-Americans. They were the ones who were really glad to see the actors who’d played the Zimbabwean-American characters, who wanted to say hello and tell them how much they liked the play. One of the audience members told one of the actresses that her kids had said to her the same thing the actress’s character’s daughter had said to her: how come you didn’t teach us the language? we wish we’d learned the language! The actress asked the woman, what’s your country? And the woman replied, Kenya. It shows the power of theater: the actors playing the Zimbabwean-American characters aren’t Zimbabwean-American, or even African African-American. They had to learn how to say their lines in Zimbabwean English, and they had to learn enough Shona to say the lines that were in Shona. But it was still real to the Africans and African-Americans in the audience. I didn’t say anything to the African-American actresses. It was a moment for other people in the audience, not for me. The actor I knew from Shakespeare class didn’t come out to the lobby while I was waiting. The audience-services guy at the desk nearby said that he might have gone out the stage door instead. So eventually I left. I did enjoy seeing “Familiar” being in the presence of people who were experiencing something connected to their culture. It wasn’t the experience I’d hoped for, but it was the experience I got.